I have thought and thought about what to do for my 500th post giveaway. I knew I wanted it to be something handmade by me…I just didn’t know which direction to take. I considered giving away my DIY Spring Wreath but the honest truth is that I wasn’t sure I could part with it. A few days ago I went back to Hobby Lobby to see if they still had the garlands. They did and I bought them. Again. So that means I can made another wreath. I’ll have one to giveaway and one to keep. It was meant to be. My giveaways are usually short and sweet but I’m going to run this one for a week. That way everyone will have a chance to enter. I’m using a Rafflecopter widget for your convenience and because it’s so easy to pick a winner. Just click the +1 arrow in the box that says “Invent Your Own Option” and enter your email address. That’s it. Anne! TY for the opportunity! So glad I came across your blog. Love seeing all the inspiration in my email….so much GOOD stuff! Oh my goodness, I’m so excited for the chance to win your beautiful Spring Wreath!! I absolutely love wreaths and I just added it to my pins recently. Thank you for sharing all your amazing recipes. Oh my goodness! I just encountered this sliverware rust spot thing TODAY as I am making my way through Spring Cleaning. Thanks for the tip! had forgotten about baking soda doing all that it does!!!! thank you for reminding me! I have been following your blog for a few months now and appreciate it all! From the decor ideas to the printables to your recipes! The oatmeal cookies are my husband’s favorites! “Those are the cookies I grew up on!” he exclaimed. Love each and every tip as well! Thank you so much for the effort it takes to blog! Thank you so much for all your ideas and tips! They are greatly appreciated! Thank you so much for all your ideas and tips. They are greatly appreciated! Congrats on you 500th post. Congrats on your 500th post. I love reading your blog. I like that entering your giveaway is short and sweet – thanks! What a lovely wreath! Thanks for the sewing tips which will help me tremendously. I always learn something from your blog! Sewing tips are great and I love the spring wreath. So glad I found you and congrats on your 500th post! Happy 500th post and happy almost spring! (It’s snowing here in VA.) Your blog doesn’t show up in my reader anymore, so I’m glad I was able to find you today. How nice of you to have a giveaway! Congrats on your 500th post! That is such an accomplishment! Also, I have a dumb question: Could you please name the three feet you pictured. Thx. Congrats on 500 posts and here’s to another 500+! Ann, I can hardly believe you are already at 500 blogs. That is certainly a milestone to be proud of. I just love your wreath and thank you for the opportunity to own it, maybe! LOL!!! Keep up the good work and I’ll keep following. Congratulations on your 500th post! Looking forward to the next 500! Congratulations on your 500th post. I look forward to each one every day! Can’t believe you are giving away the Spring wreath. I love it and was thinking of going to Michael’s to get the materials to make one! Would love to win it! Thanks for sharing! Thanks for the opportunity to win such a cute wreath! Oh thanks for the great giveaway Ann and the chance!!! Exciting and I love this wreath! Have a great weekend!! Congrats on reaching your 500th post! I enjoy reading about your lovely home and your gorgeous projects! How do you come up with your clever ideas? Thanks for the opportunity to win the beautiful wreath…..Congratulations on your 500th.post and keep up the good work!! Wow 500th post – I have loved all the ones that I have read. What a fabulous givaway too, your wreath is beautiful. I love your posts! Congrats on you 500th post. Please keep them coming! So enjoy your posts and wish you much success in all your future endeavors. I am looking forward to the next 500. Keep true to yourself and you will continue in your success. thank you so much for sharing your home and all your amazing ideas! Congrats!!! Thanks so much for all of your wonderful ideas!!! 500 posts! Congratulations! I look forward to the next 500!! Congratulations on your 500th post. How exciting! I’m so glad I found you. I enjoy every post mostly because of your warm and friendly personality. Happy Spring! (if it ever gets here). I enjoy your creativity and your post is a daily treat! Thank you for sharing, and congratulations on writing your 500th post……..WOW. congratulations on your 500th! Wow, that is awesome. Thanks for the wonderful giveaway. Love your style! Ann, your blog is my favorite! Thank you for all your lovely post. Congratulations on your 500th post! I love your blog. I look forward to it everyday. Congrats on your 500th post, which are all informative, lovely and inspiring. Thanks for the chance to win the delightful wreath. Congratulations and thank you for the chance to win that beautiful wreath you made. I love it. So beautiful and springy!!!!! A wonderful way to bring in the season. Your wreath is very sweet – and how lovely for Hobby Lobby to accommodate your wish for more garland to recreate it! Lovely! Hi Ann, congrats on your 500th post! I always enjoy your blog so much! I’m thankful for all your recipes, ideas and pretty photos! Thanks for the opportunity to win this beautiful wreath! Ann, Thank you for the opportunity to win one of your lovely creations. Always look forward to an email with your new posts, love your blog. I love your blog. I look forward every day to see if you have posted. Always something easy and fun to make. Thanks for the chance to win! I love that wreath! It just shouts Spring! I would love to win it. Happy 500th post! So excited for this opportunity! Thank you Ann! Hi Ann! Congratulations on YOUR 500th giveaway!!! I pin a lot of your projects and believe it or not, they get repined more than any other pins. I think the easy, beautiful and fresh ideas are why. I haven’t been with you for very long but I enjoy your emails…keep them coming. Thank you so much for pinning my posts! I cannot tell you how much I appreciate it. Welcome to On Sutton Place! Congratulations on your 500th post! I love your blog & the ideas you have are so fun! Thanks for the opportunity to win your lovely wreath! Your spring wreath is lovely and I do appreciate your willingness to give one of your fans one like it. But I think most of all I appreciate the simplicity of entering your giveaway! One and done!!! Love, Love, Love al that you do!…you inspire me every day!….and makes me smile…just like your beautiful wreath!…thank you! Congratulations on this milestone, Ann. I so look forward to reading your blog….seasoned and creative yet with feet planted firmly on the ground…gotta love it… Thank you! I love your blog & look forward to reading it-it is my favorite! Your ideas are simple, beautiful and easy to follow. Can’t wait to see what you .have next for us. Would be honored to win your lovely wreath. Thanks for the chance to win. Love your blog! ‘Gr8 wreath! You are so generous to share. Thank you so much for having a give away of one of your beautiful wreaths! I would love to have one for my new home. Look forward to reading your blog every day. Your home is beautiful! 500 great posts, Ann. Thanks for all your inspiration. Congrats to you – I pinned your wreath the other day and so want to make one – maybe I will be lucky and win it!! Congrats to you! I enjoy your blog! Congratulations on this special day! And thank you for this giveaway. Congratulations on this special day! Thanks for the giveaway. Happy 500th Ann….and how nice of you to make another gorgeous wreath for a lucky winner!!! I love your wreath and if I don’t win I’m going to try to make it myself. Just not sure I can get the bow right. Congratulations, Ann! And I must tell you I LOVE the Goldtouch pans you recommend. I love to bake and ordered them after reading your recommendation. They arrived yesterday, and I made my favorite bread yesterday afternoon. My husband has declared them winners. That’s not an easy endorsement to come by! I see a lot of bread making in my future. 500 posts – I have a lot to do to catch up to you Ann. 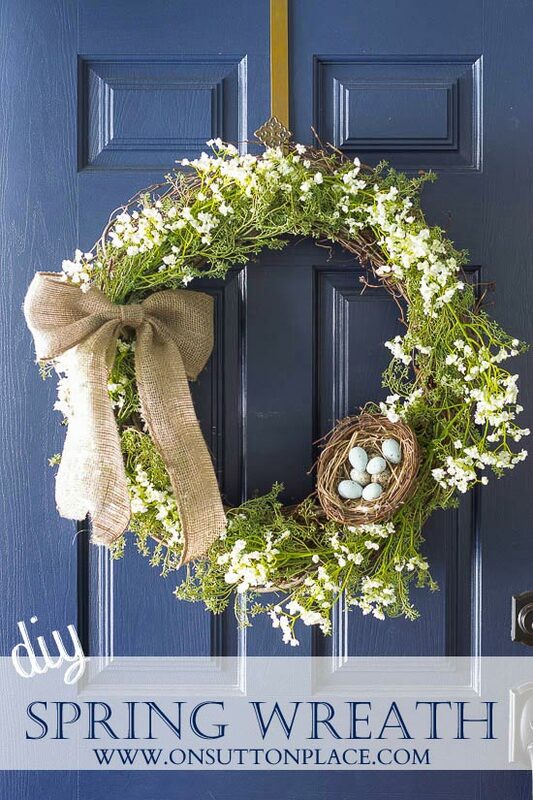 The wreath is so beautiful on your blue door. I have about the same color on my front door, so I would love to have one of your creations. I love to see what you share on your blog each day, Ann ~ congratulations on blog post #500! Wow, Ann! 500 posts! That is very exciting. And a chance to win one of your wreaths is the best idea ever! Wreaths are something that do not come easy to me for some reason. I noticed a fun wire wreath form the other day and had the idea to make a sort of rag wreath. I imagine there are tutorials all over for that! Anyway, thanks for the opportunity to win. Lovely giveaway, Ann! And I really l like how easy you made it to enter!!!! Congrats on your 500th post! What a great milestone. Love you front door wreath and I’ve signed up for the giveaway. Congrats. Thanks for inspiring me with each and every post. Great giveaway.. I love that wreath. Congratulations Ann! That’s a lot of posts! You must have a lot to say….lol. Can’t wait to see what else you post about…it’s always good. BTW, I purchased the adobe photoshop lightroom and I purchased the 35mm lens you talked about in your photography post. I love them…I’m still figuring out lightroom though! Thanks! I enjoy reading your blog and Happy 500th post Ann! Congrats on your 500th post Ann. I love your wreath and hope I’m eligible here in Canada. Thanks! Love your posts! Keep up the great work and thank you for the chance to win your beautiful spring wreath. I would love to win something from you.Thank you. Love your beautiful blog…it’s peaceful here. Happy 500th post! Thank you for the chance to win your pretty wreath! Sweet! Congratulations on your 500th post, superstar! Thanks so much for the chance to win! Love your blog everyday! I’m a new follower. Thanks for the giveaway! Look forward to reading more!